In October, Linfox signed an agreement to purchase the Aurizon Queensland Intermodal business in a deal that will see Linfox take control of the operations in January 2019. For decades, Linfox has been positioning itself to break into the Queensland and Far North Queensland intermodal market and, over the past 12 months, has made these intentions clear. “Customers told us that the potential closure of the Aurizon Queensland Intermodal business was going to disrupt their business and were looking to us for a solution. We understand the strategic importance of this region. The investment of Linfox with its safe, secure and compliant supply chain solutions will provide stability and unlock significant value for our current and future customers,” said Peter. The intermodal heritage in Linfox is strong. Mark Mazurek, CEO Linfox Australia and New Zealand spent eight years as President of the Linfox Intermodal business unit before stepping into the role of Chief Operating Officer and then Chief Executive Officer. “Intermodal is a challenging environment because there are so many variables. Every day, our team has to demonstrate that the trust of customers is well placed. Our service speaks for itself. The largest companies in Australia trust our intermodal service and now we’re preparing to bring North Queensland intermodal services to them too,” said Mark. Having lived the intermodal business daily for so long, Mark is ensuring that Linfox customers get the full benefit of the acquisition. The acquisition transforms Linfox Intermodal into a national service provider and unlocks a number of opportunities by linking Linfox’s Eastern Seaboard and North Queensland services. “This deal provides a new and compelling logistics option for businesses operating into and out of Northern Queensland. The integrated road and rail services will provide customers with speed and efficiency in delivering goods to market. We’ll also be able to provide a direct relationship and sole accountability for end-to-end service,” said Mark. Capacity is currently constrained in the North Queensland rail network with a limited set of intermodal operators. Linfox sees opportunity to secure capacity for its customers and even unlock additional capacity within the network. The advantages of rail are its capacity and economies of scale and this is set to grow with investment in Australia’s inland rail network. The benefits will flow to the transport of grain, sugar, livestock, meat, minerals and concentrates as they are moved from production, processing and storage facilities and bulk handling ports for export along the Eastern seaboard. In line with the Queensland Government’s Transport Services Contract (TSC), Linfox will continue to operate road and rail services into regional areas, such as Winton and Longreach. Currently the capacity constraints in Queensland rail impact agricultural commodities which are affected by seasonal variations in volumes. This makes competition with the more predictable needs of the mining industry for rail space more difficult. Linfox will look to increase containerised rail and road services over time to address these constraints. Intermodal freight refers to the use of different modes of transport such as road, rail, sea and air to deliver goods in the most efficient and cost-effective manner. 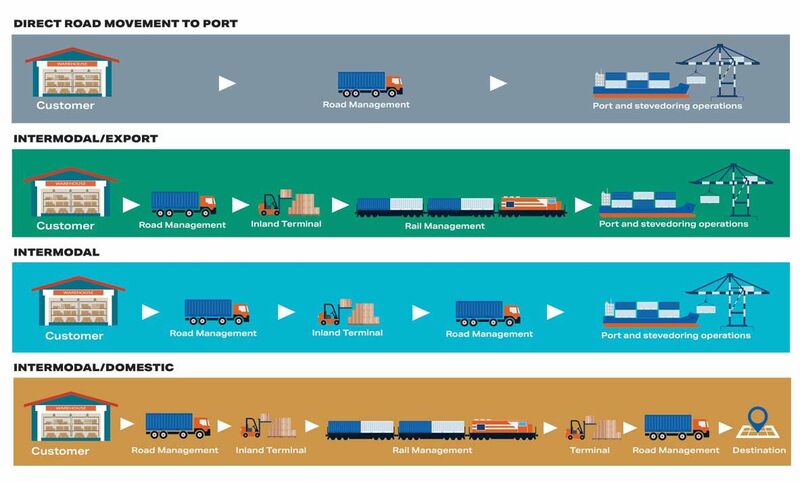 Intermodal freight terminals are the points where non-bulk freight - usually in containers - are transferred between different transport modes and allow goods to be transported via the most appropriate modes intrastate, interstate or overseas. The port system primarily serves international imports and exports. The national system focusses on the interstate movement of non-bulk cargoes. The intra-state system serves intra-state movement of freight.